Lately at work everyone has become an avid twitter user. It seems that twitter is becoming as big as email, texting, and instant messaging. Well as we all know twitter has a ton of apps available for download to improve your twitter experience. 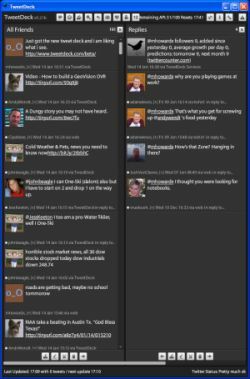 The latest one that I have been hearing a lot of buzz around the office about is TweetDeck. This new app takes only about a minute to get up and running and is the best app that I have seen yet for twitter. The app load up on you desktop and display twitter feeds like on twitter.com. It also comes with a lot of great feautures including multiple twitter columns for things such as direct messages and replies. It also will let you tweet from the application itself and has a built in tinyurl feature. The app also comes with a feature that if you scroll over som1s icon you can hit either direct message, reply, retweet, or add the tweet to your favorites.